Before there was The Abyss, there was Caldera Imperial Stout. Well, there were other big stouts too, like Widmer's KGB, but in my early days in Portland in 2003 and 2004, I remember discovering Caldera's pitch-black licoricey stout at a lively little neighborhood place called the Buckman Bistro, connected to a fancier restaurant called William's on 12th. The bistro was decorated with the clever conceit of dozens of picture frames containing only mirrors, and in the winter of 2003-2004 they were pouring an opaque stout with a thick, muddy head, from a brewery in Ashland that had only recently started distributing to Portland. Caldera Imperial Stout was a revelation: complex, sticky, bitter yet smooth. After that winter, it would occasionally pop up at the Horse Brass, but it was pretty hard to come by. I almost wonder if they stopped making it for a few years: at the Lucky Lab's 2008 Barleywine Festival, there were only older vintages: 2004 and 2005. Then in the last couple of years the brewery started releasing Old Growth Imperial Stout, and it made a splash at a few big-beer festivals at Bailey's Taproom. 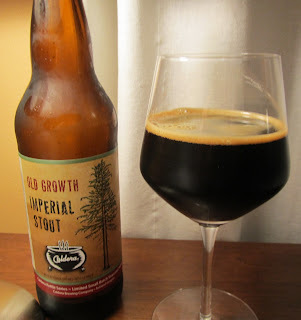 I don't know if it was always called Old Growth or if this is a new recipe, but whereas the main whispered-about adjunct in the early years was brewer's licorice -- remind you of any other imperial stouts? -- the rumor about Old Growth is that it is flavored with peppercorns. I was excited to see that the brewery bottled Old Growth this year, in bombers that go for $9-$10 around Portland. It doesn't quite live up to my grandiose memories of it as Abyss' big brother -- a caldera is a kind of abyss, if you think about it -- but it's still a beer I would recommend that you try if you get a chance. It's less of a dessert beer than older vintages, and I feel like the 8.8% strength is lower than it was back in the day. From the bottle, it pours with a dark tan head, not too thick, and not as dark as my recollections. The nose is very malty, but the beer isn't overly sweet. It has a nice dark chocolate flavor, with a long, moderately bitter finish. I said it wasn't a dessert beer; another way to express that is it's a better beer with a meal than if it was a bigger and richer stout. Quantities may be limited, so grab it while you can. Beermongers only had a case last week, though Belmont Station seemed to be well-supplied. Oh man, this is one of my favorites. So glad you brought this to my attention. I'm just discovering Imperial Stouts. I loved The Abyss. I'll have to hunt this one down as well.